A wheelbarrow is a darling on the farm or the construction site. If you have one and something happens and it’s suddenly not there, you miss it; you crave it because without it life on the farm is just something else altogether. There exist hundreds of options out in the market for wheelbarrows and all claim to be the best at what they do. Sadly, a good number of these products don’t deliver as impressive as they purport to be able to do. This gives the buyer a hard time to distinguish the product that is actually good and the one that is not. The answer is simple, in the features. The things a wheelbarrow is made of and how it is made can tell it out from the crowd, to either be a good or mediocre wheelbarrow. The United general heavy duty steel tray wheelbarrow explains to you how and why it is among the best and previous users will back the wheelbarrow on its word. Heavy duty for any wheelbarrow should not even be a discussion. On the farm or a construction site, a lot of things come into play including rough terrain, heavy and rough material, falling over, hauling potentially corrosive material; and all these require that the wheelbarrow is tough enough to take these factors gracefully. And that is why this product is made of heavy duty to withstand all the pressures of physical work. Aside from being able to be tough enough, the wheelbarrow also needs to carry an amount of material on its tray that is sufficient and satisfactory. This is because with a tray too small you will be forced to make too many trips and one that’s too big may be too heavy to haul and so it needs to be just the right size. This product has an 18-gallon steel tray to help haul just the right amount of material without having to make too many trips or being too heavy. Anyone who has worked on the farm can attest that sometimes physical work tends to be not very kind on the hands. It causes blisters and pains which call for products to be made in a way that they are considerate and take care of the user’s hands even as the job goes on. In this respect, this product is made with wooden handles so that it is not as harsh on the hands as would be metal or other material. Durability is among the most important factors to consider when shopping for a product. You need to ask yourself important questions like will it last long? How often will I have to repair it? And how long will it be before I have to get another one due to wear? The United general heavy duty steel tray wheelbarrow is made with a steel undercarriage that ensures durability and ability to withstand heavy conditions. Thus the user doesn’t have to think about the lifespan of the wheelbarrow and so forth because it lasts longer than you’d expect. Wheelbarrows are used in environments and terrains that are rough and tough. The tire of a wheelbarrow goes through hard surfaces, rocks, corrosive material like compost, dirt, sand, cement; and as a result, there needs to measures to be able to deal with such conditions. 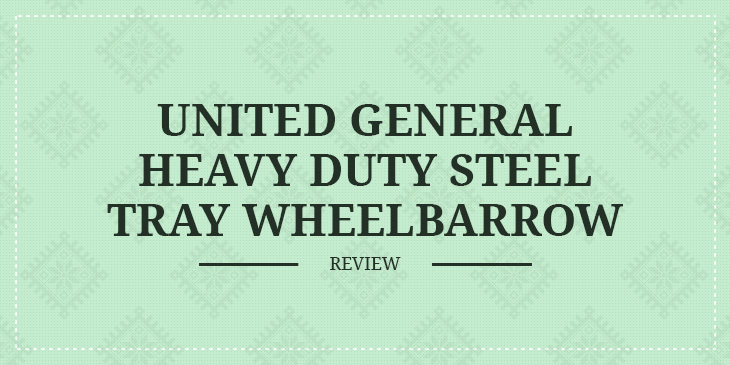 The United general heavy duty steel tray wheelbarrow has 16-inch pneumatic tires that are made specifically to handle such harsh conditions. Pneumatic means they have reinforced rubber that is tough and difficult to go through, giving it the much-needed stamina to be used in whichever farm or construction environment. The wood handles may be prone to damage. Q: Can the tires handle hard rock areas? A: Pneumatic tires can handle most environments, they are quite hardy. Q: Is there any logo or brand name on the outside of this wheelbarrow? A: Mine was okay I received it in one piece so it should be sufficient. You can know a good product from its features and this product has the features to die for. If I were you, why wouldn’t I bless myself with this wonderful piece of technology? I am sure I wouldn’t regret it. 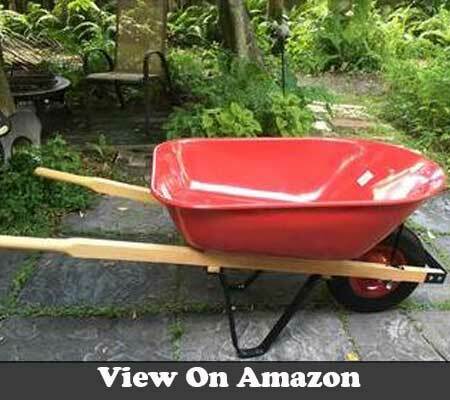 Buy United General Wheelbarrow on Amazon, Now!